What do people see when they drive by your spa or salon? Does it reflect your philosophy, culture and brand accurately? Does your exterior make your neighbors want to pull into your parking lot or step on the gas and pass you buy? Worse yet, do they see you at all? Is your spa an asset to your community or have you become the scrouge of the neighborhood? These were some of the questions we asked ourselves last year, and sadly, we had to admit that our curb appeal had room for improvement. Over the past 10 years, we had completed several extensive interior renovation projects at our 14,000 ft2 resort-style spa, but many of our neighbors were probably judging our best-selling book by its tatty cover. Comments like “I have been driving by this place for years, but I never noticed it was there” or “Wow! I would never have guessed it would be so nice inside” were pretty good clues that we needed to step up our exterior game. As active proponents of the “green gospel,” we have worked diligently to be good citizens. We purchased energy-efficient appliances and lightweight spa robes that would dry quickly. We carefully chose organic skin care lines and supported local suppliers with fresh, farm-to-table treatment solutions. We bought jewelry from local artisans to support our community and digital thermostats to reduce our energy use and minimize our carbon footprint. Meanwhile, along the street, we had a huge grassy lawn and thirsty olive trees that consumed gallons of water every day. It is not that we didn’t care how our building looked, we had just been so busy trying to survive the economic onslaught that we hadn’t noticed. When you haven’t seen your building in the daylight for awhile, it is easy to lose curb appeal perspective. When it comes to stories, everyone loves a good romance. Unfortunately, many spas more closely resemble a mystery, drama, comedy or horror from the outside. If you want your spa story to stay on the neighborhood best seller list, you need to make sure that you understand the message your exterior is sending. When we decided to tackle our exterior renovation, we used esthetic experience to give our building a facial rejuvenation. The process is amazingly similar. First, we had to analyze our current condition and set goals to achieve our desired results. Next, we put together a treatment plan that would maximize our benefits in the shortest possible time and with a specific budget. We approached our renovation with the language we were most familiar with—the language of skin care. The first step in the renovation project was to remove unwanted objects. The water-guzzling turf and trees that had been hiding our building behind a wall of foliage were removed. Once these obstacles were gone, we were surprised how much better our building looked. Like a good wax, removal of the overgrown foliage revealed the fresh, new face of our spa. Being a green spa, cutting down the trees was not our first choice, but they were in bad shape. We chose a local tree-removal company of certified arborists, to analyze and remove the olive trees. They recycle the trees they cut down by providing the wood to local artists, who use it to create bowls and other art objects. Knowing that our old trees would find new life and beauty made letting them go feel a little better. It has been estimated, by some, that xeriscaping can save 120 gallons of water a day under normal circumstances. This practice is a type of landscaping that reduces or eliminates the need for supplemental water from irrigation. Our 30-year-old landscaping was constantly plagued with irrigation leaks, which wasted a lot more water, while starving other areas of the lawn. We capped off our sprinklers and installed a drip system, which reduced our water usage substantially. 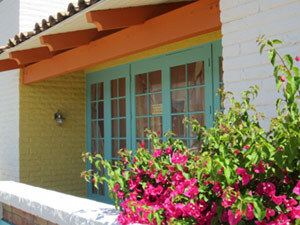 We also installed drought-resistant plants, like agaves, aloes and grasses, that are indigenous to the Sonoran desert. As these plants take root, we can gradually decrease the amount of water they need until they are self-sustaining. We chose plants, like “blue elf” aloe and yucca, to echo our turquoise and tangerine theme. Several years ago, we installed azure awnings and bamboo shutters to communicate the island theme of our spa. The relentless Arizona sun had bleached these badly, making our spa look more like Gilligan’s Island than an urban oasis. By removing these and painting our building a clean white with accents of turquoise and tangerine, we were able to bring our inside look to the street. 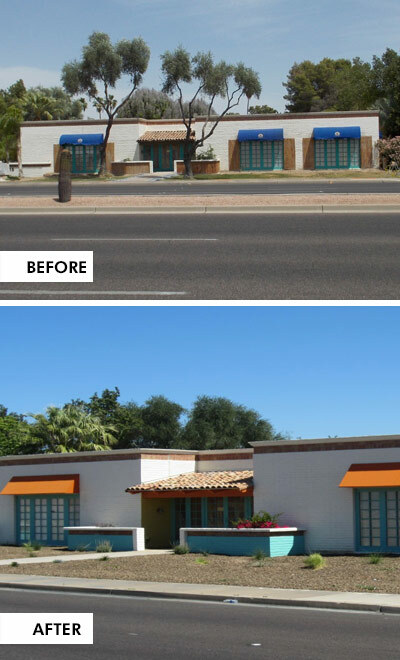 The addition of cheery tangerine awnings and a new lighted sign that matched our refreshed image gave neighbors a first impression that was cohesive with our brand. When we had our monument sign installed 10 years ago, the city required it to be placed parallel to the street. Unless a driver happened to look out the passenger window while stopped at the light, they couldn’t read it. After a decade of negotiation with the city, we finally received permission to turn our sign so it would be visible. Unfortunately, we had to move it about 20 feet north, so it would be parallel to that street. This left us with a rather large oval curb in the middle of our new xeriscape. 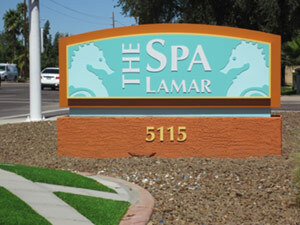 We solved this by installing an eco-turf paver hardscape in the area where our old sign was. Our inspiration was a Fabergé egg, and another locally owned family company duplicated the shape using recycled turf and pavers. Now, we have a head-turning landmark that we can embellish on holidays to bring focus to our doorstep. Someday we would love to do a renovation project where money is no object. To date, all of our projects share the same challenge—getting maximum wow with minimum mullah. We have gotten pretty good at finding ways to maximize our limited resources, in the past 10 years. Here are a few of the ways we leveraged experience, relationships and good old-fashioned sweat equity to create front page news with a byline budget. Paint. 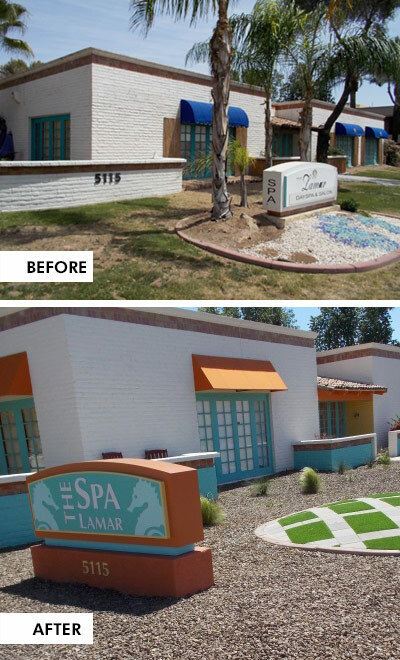 We did not have the budget to repaint the whole building, so we gave the front a fresh coat of white and used our turquoise and tangerine pallet on accent walls to create interest and draw attention to the entrance. Our painting contractor also happens to be a member of our yoga studio, so he offered to take a yoga membership in exchange for part of his fee and let us purchase the paint using his discount without mark-up. Landscaping. We participated in our cities “Turf Removal Program,” which gave us a 25% rebate on the cost of our landscaping in exchange for installing xeriscape. We used gravel from local quarries to save cost and make a smaller eco-footprint. Our landscaping contractor used his relationship with a local grower to save us 20% on the cost of plants and materials. Sign. We reused our old sign cabinet and had it refaced with a design that fit our refreshed brand. Turf Paver Hardscape. The company that installed our turf offered to trade the labor for spa gift cards so we only had to pay for the material. We got a beautiful work of art, and they got a great showcase for the 60,000+ cars that pass by each day as well as a spa day, which they needed after doing our installation. We have been making lots of new friends, now that our renovations are finally complete. After posting some of our photos on Facebook, we received a number of likes in addition to the comments below. Now that we are a better neighbor, who knows what the future may hold. 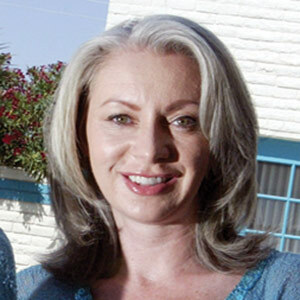 Heidi Lamar is the owner of Spa Lamar in Scottsdale, AZ, the largest privately owned resort-style spa in the city.